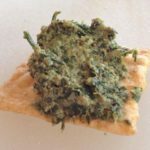 Farmer’s market carrot top pesto: Who doesn’t walk through their local fruit and vegetable market without gathering inspiration for the next family meal. I suspect that we all do. And those vegetables on display with their lush green leaves always look inviting until you discover that you are paying by the gram or kilogram and then they begin to look less inviting. 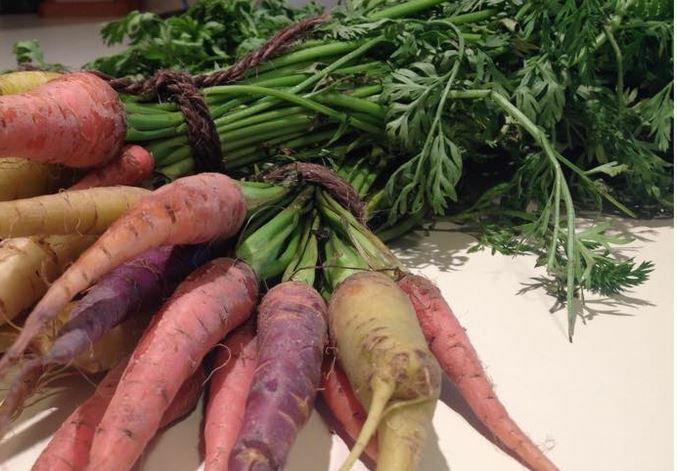 So Theresa of Rockledge Gardens, proposes that you shop for young carrots complete with their leafy tops because she has just the recipe for you. Carrot top pesto! 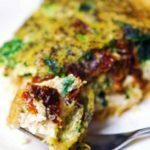 This recipe has turned out to be in the top 5 of all the recipes that have been invented at The Farm. Carrot leaves are very juicy and have a light ‘earthy’ flavor to them that pairs very nicely with walnuts and so Theresa combined them in her recipe. 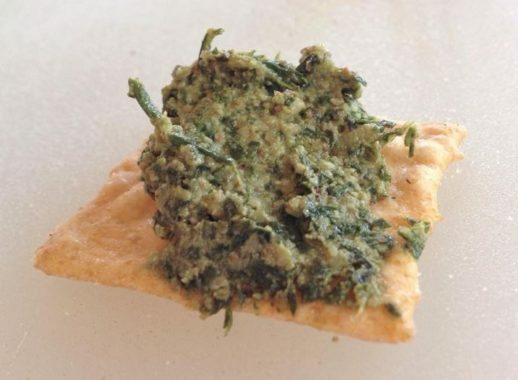 Once you have created your carrot top pesto, use it as you would any other pesto sauce. NOTE: This pesto is also good without the Parmesan which will make it suitable for vegans. In a food processor, combine the carrot leaves, oil, garlic, lemon juice and salt until finely minced. Add the nuts and pulse until finely chopped. Taste and adjust the seasoning adding more lemon juice, garlic or salt where necessary. Use immediately or cover and refrigerate for up to 2 days.